Lion Warfare: Majingilane Chase Matimbas, Matimbas Chase Majingilane! Last week saw an incredible sighting playing out on the marula crests north of the Londolozi camps. Garrett Fitzpatrick, ranger, Irishman and all-round good guy, was following up on lions roaring just over the hill. He and tracker Life Sibuyi found tracks at odds with the roaring, since they looked very fresh, yet the roaring was coming from a different direction to where the tracks were pointing. No sooner had he uttered these words than more roaring, definitely from two more males, burst forth from a few hundred metres back, further down the crest. 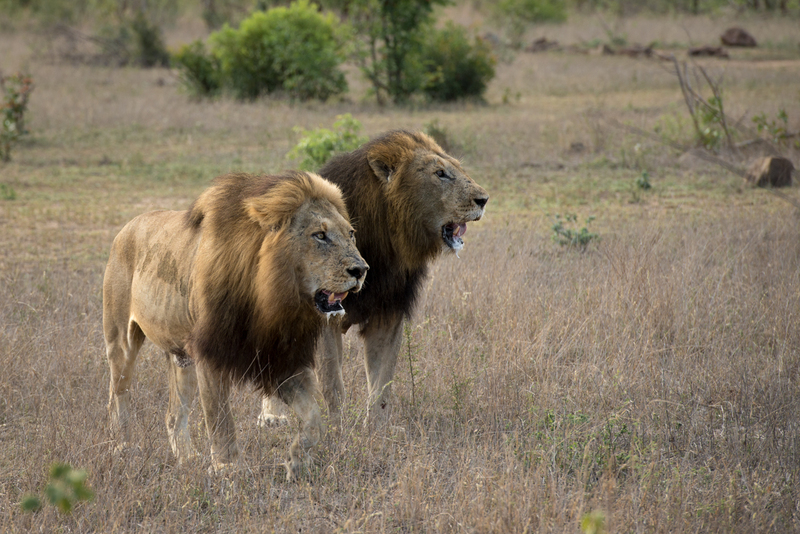 This was the Matimba males, bellowing defiance at the intruding Majingilane. What took place over the next hour can only be described as a game of vocal ping-pong between the two coalitions. 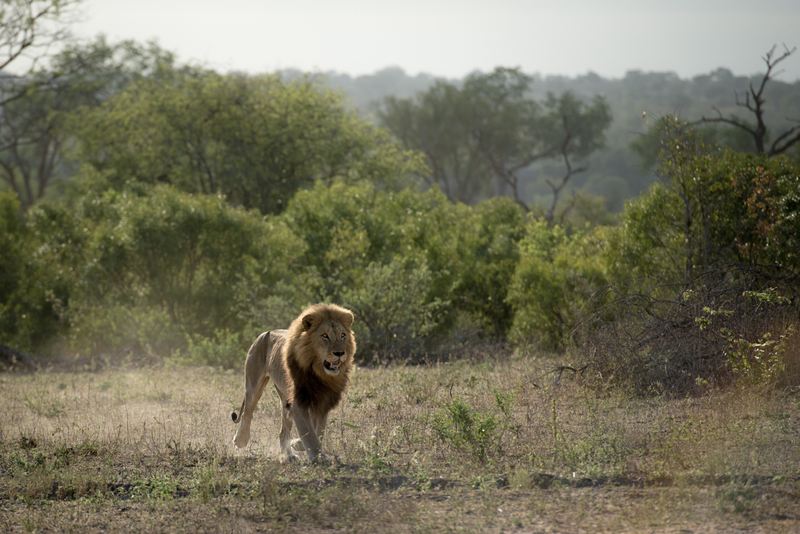 The Majingilane would roar and chase the Matimba males east through the clearings. They would then tire and begin spreading out. 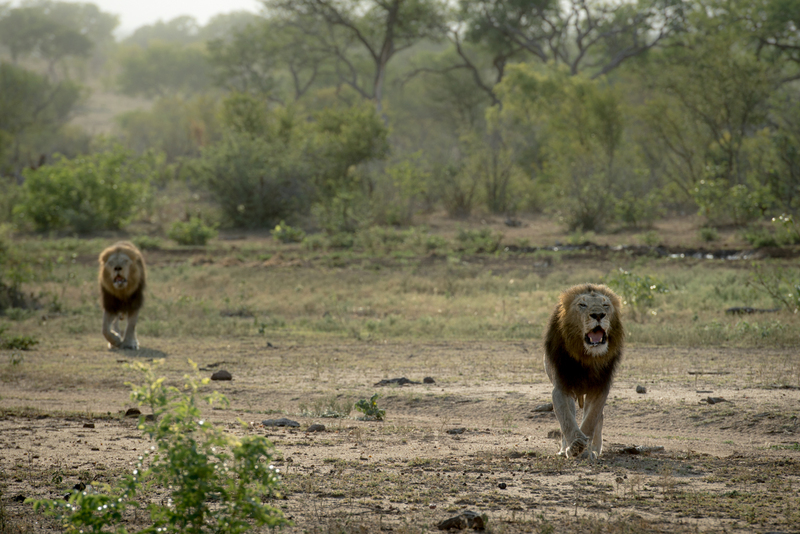 The Matimba males, looking behind them, would spot a weakness as one Majingilane became separated from the others. They would then turn and chase him back towards his coalition mates. Once regrouped, the Majingilane would once more give chase to the Matimbas. A Matimba male kicks up dust as he charges in. Like boxers shadowing each other around the ring, the coalitions went back and forth. This is the scar-nosed Majingilane, running east with the Matimbas fleeing before him. Back and forth this went for a long time, with each coalition hesitant to continue a chase to a point where actual physical contact was inevitable. There was a lot of chest beating but not a lot of follow-through. 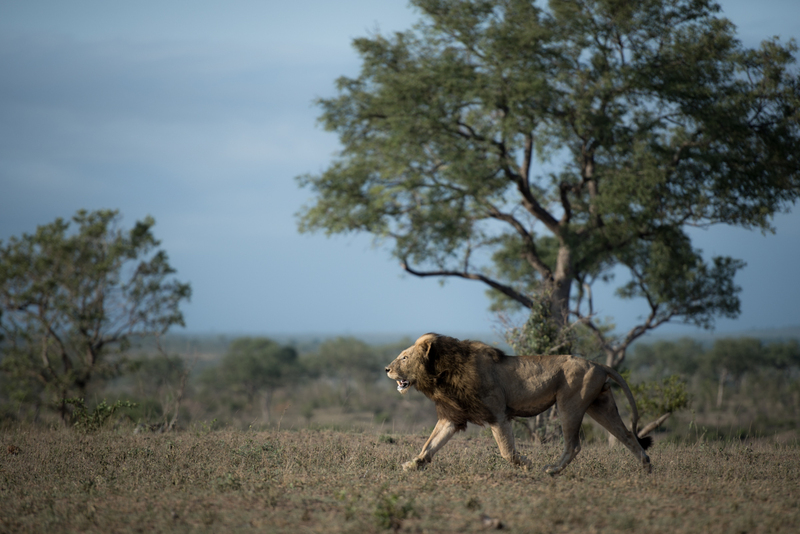 At one point the scar-nose Majingilane, salivating heavily and roaring, was barely thirty metres behind the fleeing Matimba males. They realised he was isolated though and turned to confront him, at which point he turned yet again and retreated. Eventually both groups of males were too exhausted to pursue each other further, and they lay down a few hundred metres apart, panting heavily. On multiple occasions we have found tracks of the Majingilane crossing back onto Londolozi then disappearing back into the west, but all the movement has invariably been in the darkest hours of the night, and no-one has born witness to what actually transpired. Now, however, we are left to wonder; how many times has this scene played out with nobody present? Majingilane chasing Matimba males who then chase the Majingilane… It’s like the old adage about a tree falling in the forest and no-one being around to hear it. The Matimba coalition (“Matimba” means “power” in Shangaan) give one final roar of defiance before exhaustion set in and both coalitions settled down to rest in an uneasy truce. I suppose two ageing coalitions that are both at a stage in their lives in which they are looking to do little more than consolidate territory cannot afford to be taking unnecessary risks. Nothing was really at stake here. It was simply a case of firm territorial lines being drawn in the sand. Thankfully for both groups of males, the lines weren’t drawn in blood. on Lion Warfare: Majingilane Chase Matimbas, Matimbas Chase Majingilane! Those Matimba were noticeably (wisely) silent when the 4th member of the Majinge’s was in the Sands a few weeks ago! Haha I concur! Majingis have still got it, it seems! We’ll try arrange a similar sighting for your next visit youngster! There really is only one way to explain these happenings, the boys were putting on a show for JV. Thanks for the story. Wow!!! James, how much lucky can one be in life. You seem to have developed uncanny knack of being at the right tome and right place. Beautiful blog which is equally exciting to read that I enjoyed the most. Keep going James…. Wow, great to see the Matimbas and Majingilanes again. Really missing the Matimbas on the Wildearth drives, want to swap them back and you take the Birmingham Boys ? 😉 Stay safe Hairybelly and Ginger ! Fantastic! What a morning. Wish I was there. Boys will be boys. Good to see the Majingis up & around doing what they do best. So good to see these guys again. Thank you for sharing this. What a great sighting! I tell you, never a dull moment at Londolozi! It’s so fantastic to see the Majingilane back again. I’m happy that they all settled it peacefully (so far at least) and none of them were injured. Thanks for sharing your great pictures and fantastic video with us! How many are they in each coalition? Nothing like the Mopogo coalition tho, but interesting enough. @noel wat ik read before the majing are 4 lions. are 6 but they live separated hairy belly and ginger the other live north. Unbelievable is the only word that comes to mind. Will be back in a few weeks, hope I am lucky enough to witness something like this…the perfect battle of wills with no blood shed. Lucky, lucky, lucky sighting for all who where there! Good stuff!!! I always love reading your articles James. Keep us updated on the lion interactions and dynamics. Both of these coalitions are majestic, yet prudent as well. Respect. What a great summary! I am always happy to see the Matimba around; hopefully the coalitions will keep it a bluff. James, are there ANY pictures or videos of any one of the Majingilane and the Matimba on the same screen taken? I’m curious to see the size difference, if any, between these two coalitions in general and specific lions (e.g HB, ScarNose, Ginger, etc.). We don’t have any that I’m aware of. It would probably be a serious confrontation that that would be a picture of. I’ll look around but I’m pretty sure there’s no such pic at Londolozi. To my mind the Dark-maned Matimba male is the biggest individual between both coalitions, but as you say, it’s hard to judge without having them next to each other.